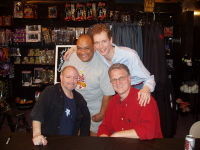 We had a signing at Dark Delicacies Bookstore in Burbank, CA. It was great. Mike Mignola, Doug Jones, Chris Drake and I signed almost a hundred DVDs. (That's not Chris with us to the left, that's Gary - Gdeo from Hellboy.com) I thanked everyone for purchasing our little movie. I take no sale for granted. The signing was great, a steady flow of people but slow enough that we could chat with everyone and Mike did plenty of sketches. A couple of people even had me do a little sketch of young Hellboy who I drew for the second Hellboy Animated comic. We also personalized the DVDs that were ordered over internet. Mike wrote the wrong name on one DVD and ended up drawing a Hellboy on it to cover it. That person is going to be very happy. Afterwards Mike indulged in some book buying, one of his favorite things. He found some great old horror anthologies. Then he couldn't leave without getting a few Halloween sculpts. He has particular tastes in that sort of stuff but Dark Delicacies had plenty to choose from. I'm happy you guys are enjoying the extras that Anchor Bay packed in there. Yes, there's too much of me but you still get plenty of insight. The next movie has different extras but still way more than the usual direct to video. Meanwhile, I'm a half hour into the script of #3. It's completely different from the first two but coming along very well. So let's hope we actually get to produce the thing. And Chris Drake is the guy to the left in the black shirt. Great! Thanks for making the time, Tad. I know it meant a lot to all the folks showing up. That's 147 by my count so far. enough to greenlight the third one? Hey Tad! !It was fun hanging out thanks for everything..it was a cool event.any chance of another signing for "Blood and Iron"? Darn!! !I should of asked for a Tad sketch..ARRRG! i anjoyed the movie with my mom, and she's already a hellboy fan! she;s a literature teacher and liked the movie and the cartoon very much! anyway, thank you for doing this, we fans appreciatte it. abraham...The Black Wedding IS digest size anyway. So if you get it on its own it will be the same. SO no need to buy a second DVD...but you can if you want and Tad certainly won't complain! Please tell me #3 will have Nazis and Lobster Johnson in it, like The Conqueror Worm.